No beating around the bush. Mappillai, as promised, is a mass masala entertainer that makes no bones, no pretences and has a distinctly comic-book feel to it. It is exaggerated and formulaic, but relies squarely on the charm of its leading man to pull off its over-the-top tone. Saravanan (Dhanush) is introduced as a Mr Nice guy who is upright and god fearing. He meets Gayathri (Hansika) the only daughter of Rajeshwari (Manisha Koirala) a rich arrogant business tycoon. When she comes to know about Gayathri’s affair with Saravanan, she immediately arranges for their marriage as she wants a docile, henpecked husband for her daughter! But just before the wedding, Rajeshwari is in for a shock as she comes to know that Saravanan has another face and is a terror in his area. How Saravanan marries Gayathri and tries hard to win over Rajeshwari forms the rest of the predictable story. Will he succeed in his attempt and how he goes about it, forms the thrilling moments. Mappillai benefits enormously from its two core strengths – Dhanush’s scorching screen presence and Manisha Koirala’s performance. Dhanush is consistently watchable and the film is a showcase not so much for his acting, but for his mass image and infectious enthusiasm. Vivek in his lengthy comic role is irritating with his funny accent, make-up and hair-style. The gags are downright silly and he seems to be taking the audience for granted. Hansika handles her role with confidence, has a smoldering presence, and is never lost even in scenes in which she has nothing to do. Music by Mani Sharma is average with Aaru Padai… and Ready Ready Ya.. being the pick of the lot. On the whole, Mappillai is a crowd-pleaser that knows exactly who its audience is. 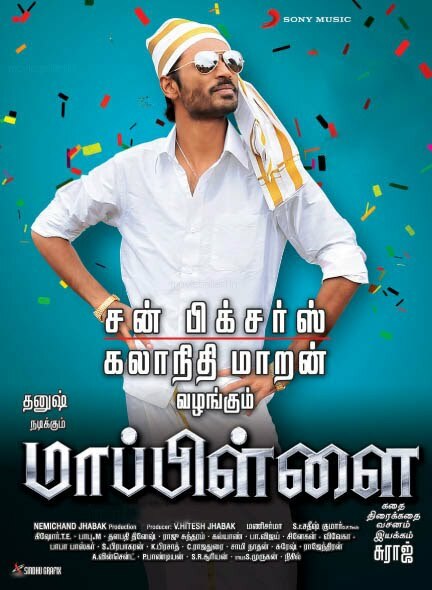 For die-hard fans of Dhanush, this old-fashioned entertainer is a treat and delivers enough entertainment for your buck.